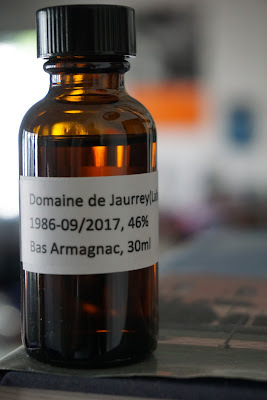 Domaine de Jaurrey Laberdolive 1986 (46.0%): Our whisky alternative month didn't end up being quiet as busy as planned because of various reasons. There are still dozens of samples waiting to be poured and I think I will continue to post reviews throughout the year mixed with whisky reviews. Anyway here is the last post this month... It's a Laberdolive Domaine de Jaurrey distilled in 1986 and bottled in September 2017. Last time I had a Laberdolive review on tire-bouchon it was 2011, their releases rarely make their way into the US market. Color: Clear and dark copper with slow thin legs. Nose: Fino sherry, cloves and nutmeg. A little thin... After airing it a few minutes more oak and spice aromas evolve. Old hardwood furniture, vintage leather and cinnamon sticks. Star anise and caraway seeds. Palate: Sweet rather than being spicy... Cooked raisins and prunes, dates and cinnamon. Like a very old grain whisky palate: Doughy with a good amount of oak, maple syrup, honey, cinnamon and brown sugar. Finish: Finishes like an old Oloroso sherry. Medium long with fading sweet spices, cookie dough and old oak staves. Overall: Hard to believe that it 46% abv. It noses and tastes like underproof... It's incredibly easy to drink because of its sweetness and thin palate but very pleasant and satisfying throughout the whole time. On the flip side if you set your expectations high for a 31 year old Armagnac it could be a little underwhelming. I liked it regardless but don't know if I would pay the full price for a bottle. Thanks again to Derek Kendzor for the sample.